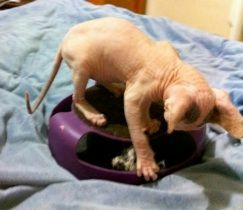 Welcome to iadore Sphynx Cattery, located in the Central West of New South Wales. We are a small, home based cattery registered with ANCATS (Australian National Cat Society) and as such we are bound by their rules regarding the breeding and housing of our cats. 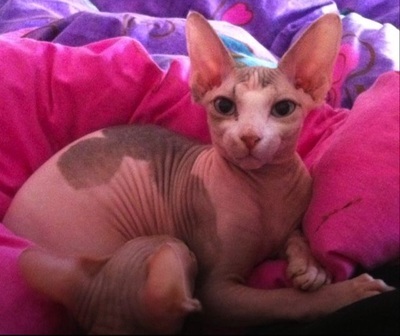 Our Sphynx all live inside our home and all kittens are raised with lots of love and attention. Our queens are limited in the number of litters they have per year to ensure their and their kittens optimum health and welfare. 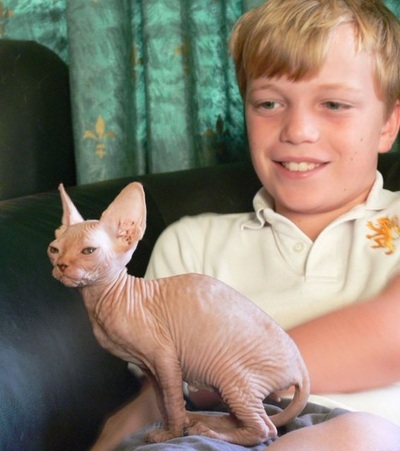 We have been breeding Sphynx for over 15 years and pride ourselves on breeding the best Sphynx we can. Most of our kittens are $2,000.00 each. All kittens are sold with a non-negotiable sales contract. A deposit is required if you would like to hold a kitten. Kittens are sold vaccinated, vet checked, microchipped, registered with ANCATS, regularly wormed, well socialised and desexed. 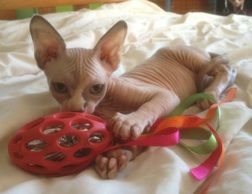 Kittens leave here with a 6 week pet insurance policy with Pet Plan and we recommend all Sphynx babies continue with pet insurance for your own peace of mind. We are happy to send our babies interstate. If a kitten is going interstate, a new airline approved travel crate (which you keep) will be supplied for around $50.00. Our prefix is Iadore and this means your kittens registered name will be iadore -------- . If you buy your kitten before he or she is named, you can work with me to choose your kitten's name. We do not sell entire cats for breeding so please don't ask. Our Sphynx are, to the best of our knowledge, clear of common cat illnesses and hypertrophic cardiomyopathy (HCM) - BUT current testing only tells you if your cat is clear at the time of assessment, not whether your cat or kitten may develop HCM in the future. Cardiomyopathy may be genetic but as current researchers and vets cannot find a gene or specific cause for it in the majority of cats of any breed, we cannot be expected to predict where HCM might turn up. It is also believed that HCM may be the result of an illness such as a viral infection setting off the problem in a cat which is genetically predisposed. ​Until they find the gene responsible, No breeder or vet can guarantee that any cat or kitten will not develop a cardiomyopathy or other illness in the future. Breeders may do annual or more frequent tests on their cats but this does not mean your kitten will not develop this disorder in the future. Breeders who claim otherwise are wrong. 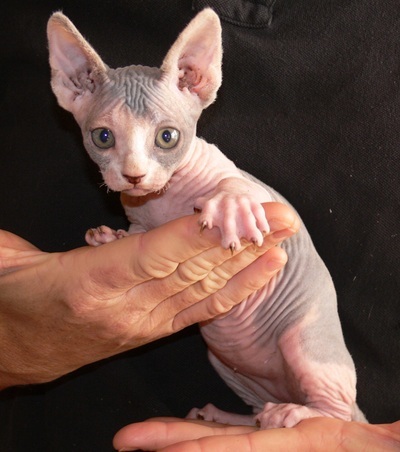 ​All our breeding stock have very specific medical examinations and all kittens have thorough veterinary health checks. Issues such as inheritable disorders or potential HCM are covered in our contract. HOW TO MAKE Cat coats for your kittens and older cats. 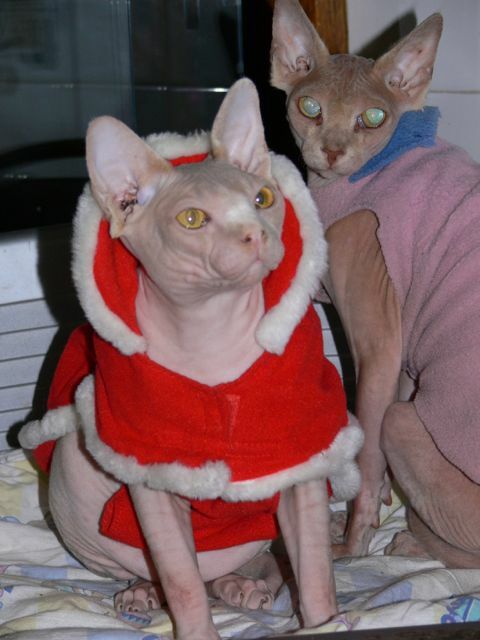 As a breeder of hairless cats I need to keep the babies warm, especially when they are travelling and flying interstate. I have worked out a way to make very inexpensive and great fitting cat coats without sewing, and I have put the video on you tube so you can learn how - (see the link at right). These coats are also great for smaller dogs, and especially dachshunds which require the longer length in coats.